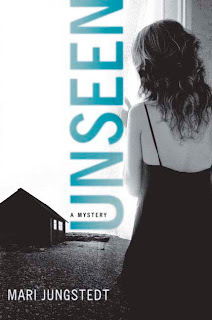 Unseen, by Mari Jungstedt, came out last year in the U.S., but until recently it escaped by attetion somehow. It's a police procedural that has inevitably been compared to Henning Mankell's novels but is actually quite different. It's another of the "collective" novels that have been coming out of Sweden: as with Åsa Larsson's novels of the far north of Sweden, Jungstedt's story of Gotland (an island in the Baltic just off the Swedish coast) has a central character that only occasionally takes center stage. That alone takes this police procedural away from Mankell territory (his detective, Kurt Wallander, is at center stage all the time, except when--usually later in the books--the killer is at the center of the narrative). Jungstedt's detective, Anders Knutas, is in many ways less well defined than several of the other characters, including the best friend of what is thought to be the first victim of the novel's serial killer (and the journalist who befriends her). A woman is killed with an axe, along the shore after a violent argument with her boyfriend. Then another woman is killed on her way home from a bar, where she had flirted with a stranger. And as the victims pile up, there's no thread linking them. The collective, split point of view works very well in carrying the story forward step by step, withough anticipating too much of what's to come. But there are two flaws, to me, with the book. The killer's voice periodically interrupts unnecessarily--I would have been happier with the book if I'd simply skipped those passages (conveniently italicized). I might actually try that exercise if I read the book again. And a more substantial flaw is that the ending is both sketchy and cliched. After proceeding at deliberate speed throughout, Jungstedt feels it necessary to kick into such a high gear at the end that it's difficult to visualize what's happening (except that we've been over this particular high-stakes, high-tension ground so many times that the film almost runs in our head without the author's help). There are a couple of uniquely Swedish twists--such as the consequences of the novel's final death (something that readers not already conversant with the mores and the correctness of Swedish police novels may find a bit startling). I won't say more because I don't want to risk inserting any spoilers. Unseen was good, if not perfect--better in some ways than either Helene Tursten or Åke Edwardsson (two other prominent competitors for the other-than-Wallander detective spot) and I'd recommend it--and I'd definitely read any further translations from her work (I think there is a German tv movie of at least one of her novels, with more forthcoming--Swedish detectives on Gotland speaking German, no doubt, just as Donna Leon's characters speak German in the Venetian setting of the German tv adaptations of her work).